Defense+ allows you to lock-down files and folders by completely denying all access rights to them from other processes or users - effectively cutting it off from the rest of your system. If the file you block is an executable, then neither you nor anything else is able to run that program. Unlike files that are placed in 'Protected Files and Folders', users cannot selectively allow any process access to a blocked file. 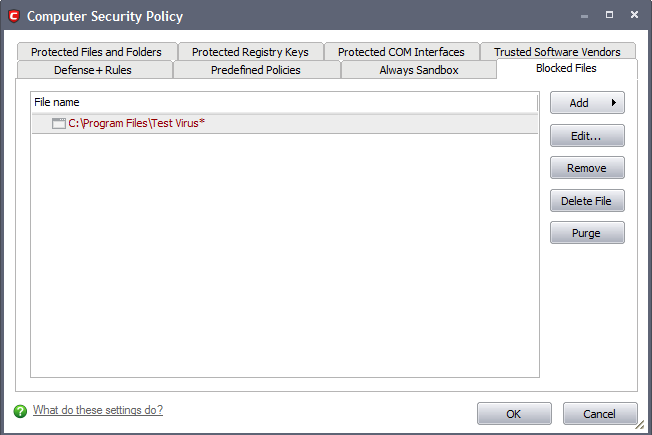 Navigate to: Defense+ Tasks > Computer Security Policy > Blocked Files. Click the 'Add' button. Click here for a description of the choices available when selecting a file. Alternatively, files can be transferred into the blocked Files module using the 'Move to 'button in the 'Unrecognized Files' and 'Trusted Files' areas. Select the entry and click 'Edit' button. The 'Edit' dialog opens for changing the file path. Alter the file path as required and click 'Apply'. Select the entry and click 'Delete File' button.